We released SAP ASE 16.0 SP03 PL05 a few weeks ago. What’s in it for you? Well, if you’re using our HADR system with a disaster recovery (DR) node, I’m glad to share with you that your system will be more secure and efficient with SAP ASE 16.0 SP03 PL05. Why? Because we now support replicating data from the primary SAP ASE to the DR node when the standby SAP Replication Server is down. 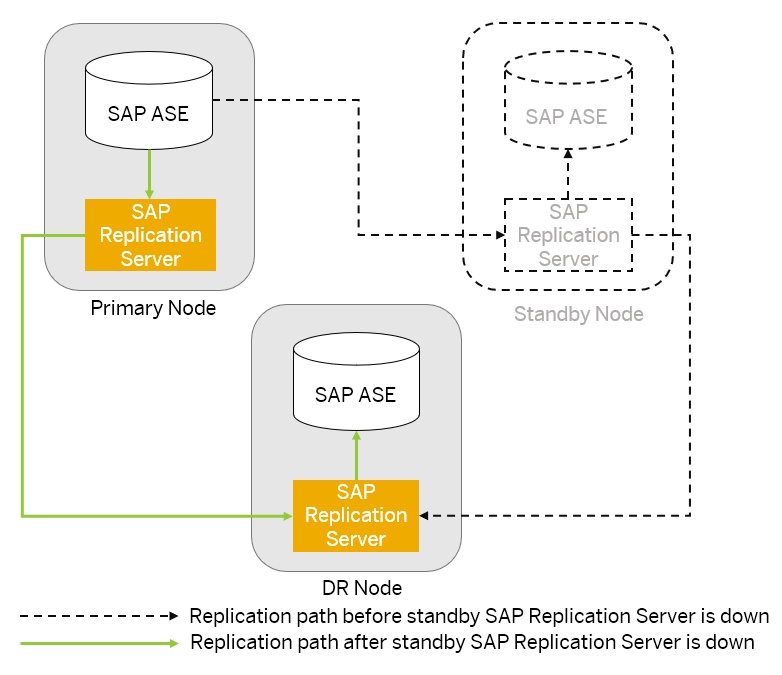 In a typical HADR with DR node system, the SAP Replication Server instance on the standby host receives data from the primary SAP ASE server, then replicates data to the SAP Replication Server instance on the DR node. Previously, replication to the DR node stopped when the standby SAP Replication Server went down. Now, to avoid data loss and to ensure disaster recovery, you can configure the primary SAP ASE server to bypass the standby SAP Replication Server, and replicate data to the DR SAP Replication Server directly. As you can see, the data now is replicated from the primary SAP Replication Server to the SAP Replication Server on the DR node. More importantly, the data replicated to DR is also cached in the route queue from the primary to the standby SAP Replication Server. This way, if you restore the standby SAP Replication Server before the route queue fills, you can resume replication from the primary to the standby SAP ASE without having to rematerialize the standby SAP ASE. If you cannot restore the standby SAP Replication Server before the route queue fills, the data uses up disk space and blocks replication from the primary SAP ASE. When this happens, you need to disable the replication path from the primary SAP ASE to the standby SAP Replication Server, then rematerialize the standby SAP ASE after the standby SAP Replication Server is restored. What if you cannot restore the SAP Replication Server instance on the standby host? Remove it permanently and recover the replication path from the primary SAP ASE to the SAP ASE on the DR node only. For detailed instructions on recovering replication after the standby SAP Replication Server is down, visit our documentation on the help portal: Recovering Replication to DR Node When the Standby SAP Replication Server is Down.